Although many of the blasters offered by Nerf are perfect for both boys and girls, Nerf does have its own series with designs and decorations that are specifically targeted towards girls. 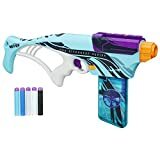 A lot of these blasters are truly brilliant and give girls who have their focus set on beauty as well blasting the ability to conquer in Nerf battles. That being said, not every blaster from the Rebelle series is amazing and if you have a friend, daughter, or relative in your life who is a true Nerf enthusiast, you don’t want to give them anything less than the best. To help you figure out which Nerf gun will be the best for this purpose, here is a list of the 7 best girl Nerf guns for unlimited fun. Here is the best Nerf girl guns with ratings. Blasters can be powerful so it is important that you provide young Nerf enthusiasts with a blaster that is easy to use and even easier to handle. 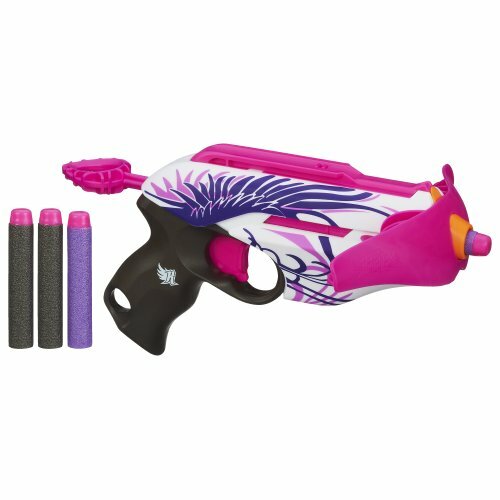 In the case of extremely young girls who want to start trying out Nerf blasters, we recommend the Nerf Rebelle Pink Crush Blaster. 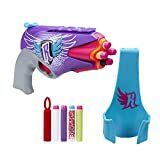 The Nerf Rebelle Pink Crush Blaster is a single shot blaster that is lightweight and still strong enough to compete against other blasters both outside and inside of the Rebelle series. Featuring a stylish white, pink, and purple body, this Nerf gun uses a pull-back cocking mechanism to prepare the bullets for launch and comes with a cool detachable crossbow arm that can be added to the front of the gun for those who want to build upon the original design. Use of this blaster is simple. All it requires the user to do is to pull back on the handle and place the dart into the front of the gun. Once you are ready to fire, pull the trigger and the dart will be launched. Darts are said to launch approximately 75 feet and because of its simplicity, there are few to no problems experienced with the gun itself. If there is a young girl in your life who is ready to start their Nerf adventure, the Nerf Rebelle Pink Crush Blaster is the way to go! For younger children who are new to blasters but who still want to be able to compete with bigger kids during Nerf battles, having a single shot blaster can become a little frustrating. Still, you don’t want to give them a blaster that is too big for them to handle. The solution? Let the girl in your life get her hands on the Nerf Rebelle Lumanate Blaster. The Nerf Rebelle Lumanate Blaster holds and fires up to three bullets rather than one, features a pull-back cocking mechanism that is easy to use, and has one extra special feature that makes it much more appealing to young kids: the ability to glow in the dark! Using a special button located just beneath the trigger, children will be able to turn on an LED light that rapidly charges the tips of their special darts, making them ready to go as soon as the trigger is pulled. Much like the previous selection, this blaster is very simple to use. Pull back on the handle, load all three darts into the front of the gun, pull down on the button to charge the dart tips, and fire at will. Once you’ve fired one dart, pull back on the handle before you fire the next dart as you will need to do this before each shot. In addition to these impressive features, the body of the blaster features a stunning white and blue design and is said to be capable of launching darts up to an impressive 85 feet. The functionality of this blaster is great but the only downside is that the darts are made for this gun specifically, meaning that it could be costly and inconvenient to replace bullets if you lose them. Nerf blasters don’t have to be huge in order to be powerful and this glow in the dark blaster lives to prove that point. For the girl Nerfer who wants a little extra kick but who can’t yet handle the larger blasters, you should purchase the Nerf Rebelle Lumanate Blaster. We are finally moving into older girl territory with the addition of the Nerf Rebelle Secrets and Spies 4Victory blaster to our list. The Nerf Rebelle Secrets and Spies 4Victor is just as easy to handle as some of the other blasters on our list, featuring a hammer cocking mechanism rather than the traditional pull-back piece, a rotating barrel capable of holding up to 4 darts, and a lightweight design that will allow you to take full advantage of the blaster’s one-handed design. This gun provides users with a hefty kick, launching darts up to 65 feet, and is a great blaster for those who wish to wield two in battle, since it only requires one hand to operate with the exception of having to reload the bullets, which won’t be too difficult since you can load through the front. To begin using this Nerf gun, simply load all four bullets into the rotating barrel and pull back on the hammer using one finger when you are ready. Then, fire the gun and repeat by pulling back on the hammer with each shot. With buyers loving this choice of blaster, the Nerf Rebelle Secrets and Spies 4Victory is great for the Nerf lover who is finally ready for the bigger blasters. One of Nerf’s most unique offerings are their blasters that feature crossbow firing or ones that are simply bows and function in a similar manner. 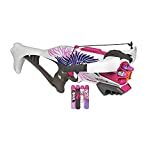 Fortunately, Nerf has created these products in the Rebelle line, which brings us to the Nerf Rebelle Guardian Crossbow Blaster. 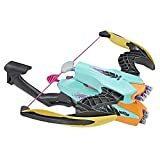 The Nerf Rebelle Guardian Crossbow blaster is a Nerf gun that is designed to look like a crossbow but acts in the same way as a blaster, which can be viewed as both a disadvantage and an advantage for those who want to be able to fire rapidly. This blaster has a large purple and pink body with a rotating drum capable of holding up to six bullets and a shoulder support that gives you additional accuracy when you steady your aim. On the front of the gun, there is a crossbow-shaped addition that includes a string that can be pulled back on the tactical rail located on the top of the gun. When fired, darts are capable of reaching distances of up to 75 feet. To fire this crossbow blaster, simply pull back on the pump located on the bottom front end of the gun. That’s all that’s required to work it. However, since it is pump action, you will need to pump each time you would like to fire. Overall, the Nerf Rebelle Guardian Crossbow blaster is an excellent blaster from those who want to deviate from the norm and choose a gun that stands out from the competition. Some prefer design and aesthetic over functionality. For a lot of the products in the Rebelle series, however, you don’t have to choose one over the other and in the case of the Nerf Rebelle Combow, it gives you the crossbow action that the previous mention didn’t provide. The Nerf Rebelle Combow is a dual action Nerf blaster (get it… combo?) that allows you to use your blaster as a gun as well as a crossbow. The blaster portion, which is featured at the bottom of the device, is capable of holding up to 4 darts at a time and utilizes a pull-back cocking mechanism to make firing simpler. The crossbow portion of the blaster, which is a removable piece that is installed on the top, is also capable of holding and firing up to four darts and utilizes a pull-back cocking mechanism as well. Although there is no exact range listed for how far the Combow can shoot, it is stated that it is able to shoot approximately 60 feet and because it is part of the Accustrike series as well, the shots made by this blaster are extremely accurate. The use of the blaster/crossbow combination can be a little difficult for some but it is simple once explained. To use the blaster and the crossbow at the same time, pull back on both handles for the blaster and the crossbow. To shoot the blaster and the crossbow separately, pull halfway on the handle to launch the blaster darts and the rest of the way for the crossbow dart. To shoot them at the same time, pull down on the trigger and two darts will launch. 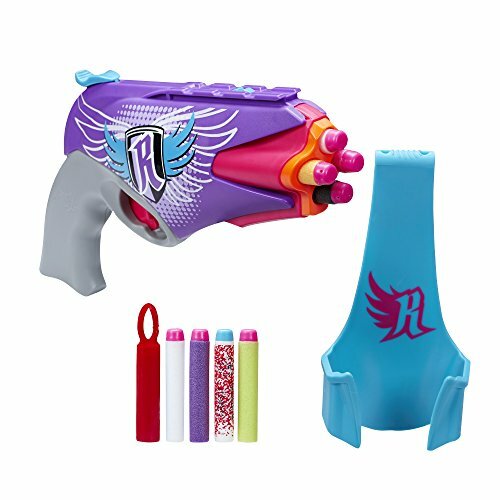 Another excellent Rebelle option and one that many recommend for serious Nerf fights, The Nerf Rebelle Combow gives girls the ability to enjoy the fight that both the blaster and the crossbow provides. Serious Nerf wars call for serious blasters and not all of the options above will give girls the firepower that they need to reign victorious. In a situation like this, we recommend stepping up your game and the Nerf Rebelle Powerbelle blaster is an excellent place to start. 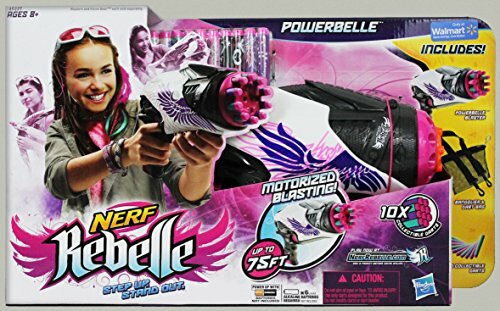 The Nerf Rebelle Powerbelle blaster is a fully-motorized blaster that features a ten-dart rotating barrel capable of blasting away enemies at a range of approximately 75 feet. The body of the gun is rather lightweight for a motorized blaster (although the six AA batteries will certainly take up a bit of space) and has the traditional Rebelle design with pink and purple wings across the face of the blaster. This fully-motorized blaster is much more functional than other Nerf products as all you will have to do in order to use it is hold down on the trigger. There is no additional button you will need to press in order to shoot as you would with similar Nerf products, making it a truly desirable piece of weaponry. The only downside that is said to accompany this weapon is the overall noise level that is made when it is in use, which can give away your location during a Nerf battle. That being said, the Nerf Rebelle Powerbelle blaster is a great blaster choice for those who need more firepower and are okay with making noise. The price point is slightly higher than others so you may need to search on Amazon for other options of the Powerbelle. For our final mention on this list, we decided to select the Nerf Rebelle Divergent Series Allegiant blaster. 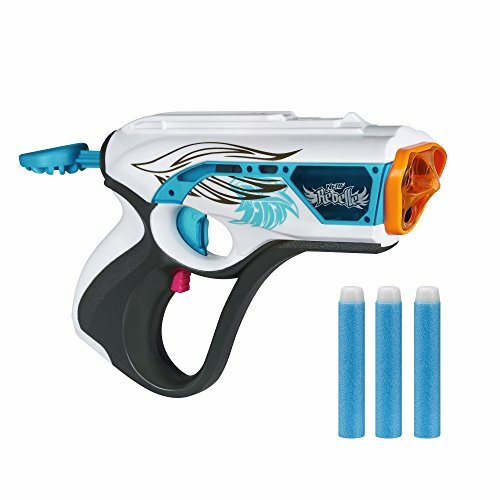 The Nerf Rebelle Divergent Series Allegiant blaster was designed specifically to promote the Allegiant movie within the Divergent series and features a more intricate design that represents the Divergent series as well as additional stickers that can be used to further decorate the blaster. Looking past the body and design of the blaster, the gun itself is quite simple to use. Unlike most blasters that use a pull-back, pump action cocking mechanism, this Nerf gun combines it with a 12-dart clip so that you can easily rapid fire and reload your device, easily making it a crowd favorite. Includes blaster, 12-dart clip, 12 darts, sticker sheet, and instructions. To begin using this blaster, feed your clip into the rectangular opening located at the bottom of the blaster and pull back on the pump located on the top of your gun. Then, pull the trigger and repeat the process until you have completely emptied your clip. Each dart is said to travel approximately 75 feet! Although this blaster has been generally well-received, some users have said that they have an issue with jamming. Generally, this can be avoided by making sure that the clip is loaded and installed properly before you begin using it. Blasters with clip designs are great and this unique product is no exception. If you need extra ammo and want to make sure that you are always ready to go on the battlefield, you will definitely be interested in the Nerf Rebelle Divergent Series Allegiant blaster. Nerf is not just a boy’s hobby and Nerf knows that. 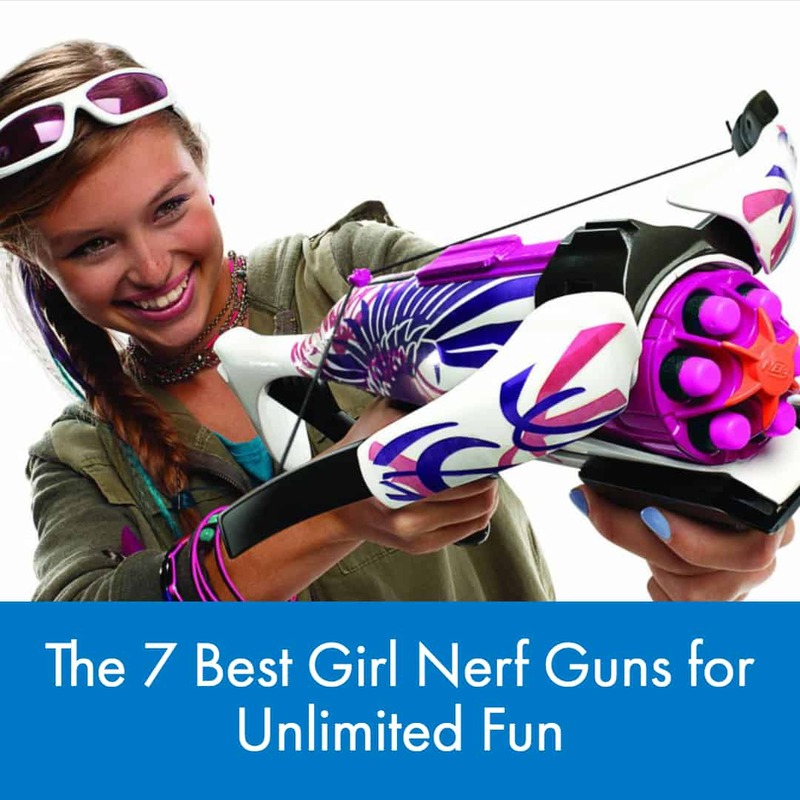 Empower the girl Nerf enthusiast in your life by gifting her with one of the best girl blasters listed above! If you’re looking for even more ideas for Nerf guns for girls, take a look at this YouTube video that covers some of the best Nerf guns that the Rebelle series has to offer!